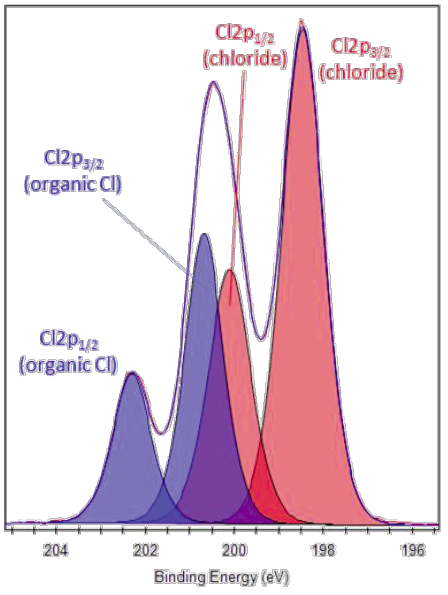 In the presence of high selenium or arsenic concentrations, acquire Cl2s as well as (or instead of) Si2p peak. Polymer materials containing Cl may degrade during X-ray irradiation or argon ion sputtering, losing chlorine. For chlorine-containing polymers which may be sensitive to X-ray exposure, acquire C1s and Cl2p regions first, before moving onto survey and/or other elemental regions. Check for presence of Cl2s peak in survey spectrum and spin-orbit splitting in Cl2p high resolution spectrum to confirm assignment. Cl2p spin-orbit splitting (Δ=1.6eV). Each chemical state has two spin-orbit split peaks (compared to oxygen, for example, which has one component for each chemical state). 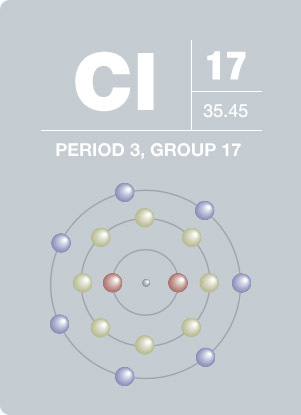 Example below from a sample with chloride and organic Cl. Peak fit is with two sets of spin-orbit components; one set for each chemical state. When quantifying chlorine fit in this way, turn off the Cl2p1/2 components for each chemical state in the main peak table. Chloride ions can result from contamination, especially if the sample has been handled without using gloves. A large hydrocarbon content and presence of Na may also indicate contamination due to handling. Chlorine is a greenish yellow gas that combines with nearly all elements. In nature, chlorine is found as the chloride ion that is deposited in the earth or dissolved in the oceans. High concen- trations of chloride are found in the Dead Sea, and about 1.9% of the mass of the world’s sea water is chloride. Chlorine gas was used against humans in World War I as a killing agent. Chlorine is an ingredient in many everyday items and is an important chemical in water purification, disinfectants, and bleach.